Provision of information on this site is for educational and research purposes only. The material is general in nature. 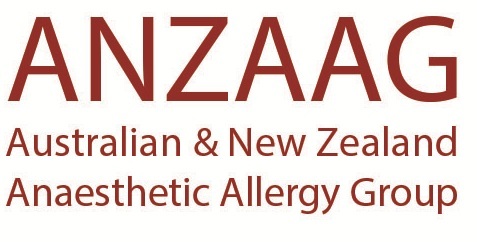 It is made available on the understanding that the Australian and New Zealand Anaesthetic Allergy Group (ANZAAG) is not thereby engaged in rendering professional advice. Before relying on the material in any important matter, users should carefully evaluate its accuracy, currency, completeness and relevance for their purposes, and should obtain any appropriate professional advice relevant to their particular circumstances. In some cases the material may incorporate or summarise views, guidelines or recommendations of third parties. Such material is assembled in good faith, but does not necessarily indicate a commitment to a particular course of action. Links to other web sites are inserted for convenience and do not constitute endorsement of material at those sites, or any associated organisation, product or service.